One of our top sellers. This temperature gun will give you precise data so you can have perfect cooking results and not be incinerating foods. The compact design is simple to use and includes batteries and a plastic carrying case. 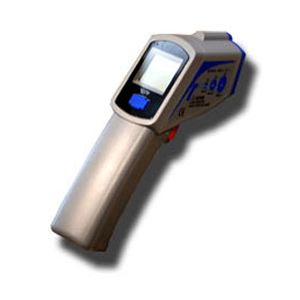 This precision product offers laser targeting accuracy(12:1), enhanced back-lit LCD Display, and an expanded temperature range(-58° F to 932° F) and an accuracy of +-2%. The Wildwood temperature gun offers a cost effective, reliable and accurate way to measure the temperature in every spot of your wood fired oven or barbecue grill surface. This is a must have in your oven or BBQ tool kit. this is a great option to the more costly built in oven temperature gauges or as a way to cross check temperatures in the oven. Especially useful when baking breads, it is extremely important to know the exact temperature of the hearth when baking breads to ensure your loaves come out perfectly baked.